While I enjoy eating fish (especially sashimi & sushi!) I am not much of a fisherman – ten minutes on the water and I am about ready to head home again, although I do like the saying by Henry David Thoreau: “Many men go fishing all of their lives without knowing that it is not fish they are after.” (And of course, the other funny but presumably untrue fishing quote: ‘the best two days of a boat owners life are the day he buys a boat, and the day he sells it!’) and while the idea of night fishing is intriguing, in my case it wasn’t fish I was after. And I also wasn’t on the water. The first night when I arrived in Little Huia I was struck by a beautiful sound I hadn’t heard in years; the melancholic call of the Ruru/Morepork. The Morepork is an owl, native to New Zealand and as a night bird it is rarely seen, and generally only heard when you are in a quiet rural location. The other aspect of the Ruru that amazes me is a sound you will never hear: its silent wings. Other native birds such as the Tui and the Wood Pigeon have beautifully audible wings, flitting through the trees they remind me of the sound of a Japanese fan being (very) rapidly waved – I have recorded some of these while in Huia and will post them in a future post. But the Ruru is a highly evolved night hunter, its incredible eye sight and silent wings means its prey don’t know to hide until its too late! That video doesn’t feature the morepork at night nor its call, but as I had heard them in the trees behind my house in Little Huia, I decided my first mission would be to try & record a Morepork close up. So here started my night fishing missions! My first attempt was a dismal failure, and in hindsight laughable. I put together a portable record kit and prepared to head out into the night. My night fishing rig included a Sound Devices 744 recorder & 302 preamp, a Telinga parabolic dish with MKH8020 and a pair of MKH8040s. I jumped in my 4WD and headed up the hill a bit, following the road to Whatipu and stopping every so often to listen. When I thought I was close to some Moreporks I would jump out, grab my backpack & start walking towards where I thought they were. But here was the problem: just as I started to get close to one, it would stop calling. And even if I waited, it would not start again. In hindsight, with its silent wings it had more than likely flown away without me realising. So after a couple of hours of this sort of behaviour I headed home with what I thought was only three single calls – a start but hardly what I was hoping for! I suspect I will do more of the set up the mics and leave it recording approach, and one idea I had help protect the gear incase of a sudden shower was to somehow rig up a small umbrella. 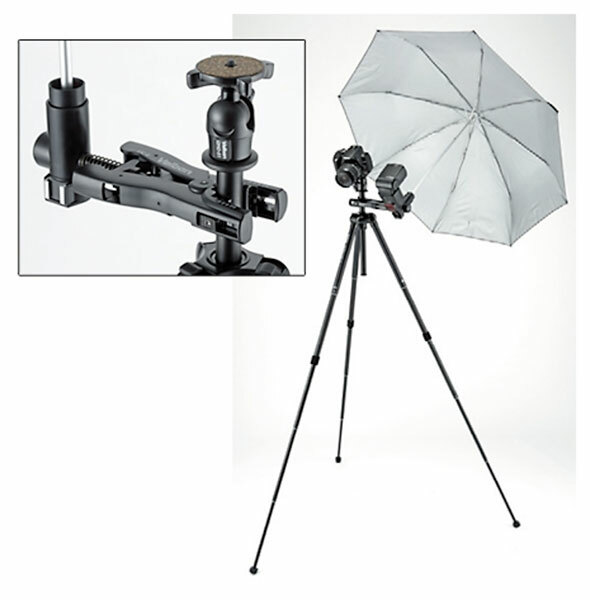 After doing a quick search I found & ordered this handy device, the UC-6 umbrella and clamp made by Velbon. While checking out other Velbon products I also came across their ultra compact tripod: the Velbon UT series looks like a more compact AND more sturdy tripod than what I am currently using as a mic stand for my MKH8040s! 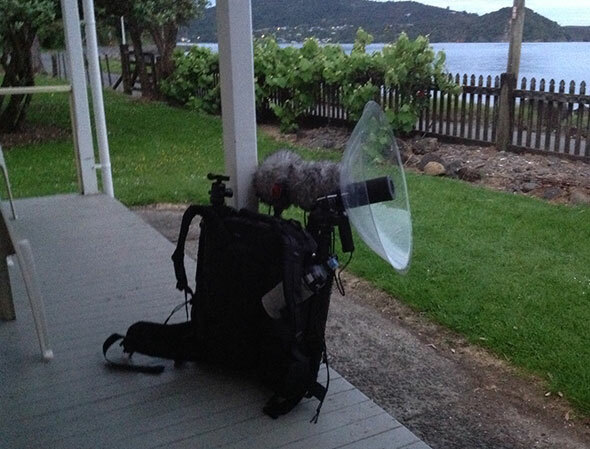 I put my mixer/recorder in a drybag, no problem so far in northland downpours! Mics? The windjammer & high windcover combo seems to solve any issue, so far.. They’ve been thoroughly soaked overnight in torrential rain and the biggest hassle is drying them out for the next days recording. Neutrik waterproof XLRs help too, they really work. 48 volt phantom power + a sensitive diaphragm + thoroughly soaked?? Hello, I have been searching for information on an urban bird that calls at night. It is similar to the morepork’s secondary (kiwi-like) call but isn’t trilling upward but more an “eeeOW” flat (or slightly arched) call. This in Auckland (Birkenhead, and I do see raptors sometes as Kauri bush isnt far). Any thoughts? Do ruru have different secondary calls? I hear their primary (“more-pork”) calls sometimes around here, too. Thank you. Maybe you should check out WhangaRURU where the birdsong is not only heard frequently and the locals are visited regularly. Ruru up here are very curious and even check out campers or overnight.